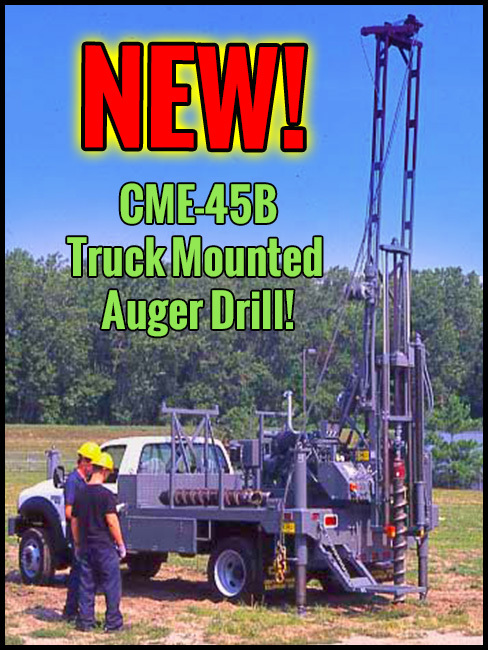 CME-45B Truck Mounted Auger Drill! We are proud to announce the addition of another new drill rig at Total Support Services, Inc.
We recently took delivery on a New CME 45B. The CME-45B is powered by a 197 cubic inch [3.2L] Deutz air-cooled 3 cylinder engine rated at 57 horsepower. The drill is mounted on a 4x4 (four wheel drive) super duty truck. The CME-45B is also equipped with an automatic hammer, breakout table, extruder and 3L6 moyno pump. We look forward to being of service to our customers in 2018! CLIENTS: Please CLICK HERE TO TAKE OUR JOB SURVEY and let us know how we did on your job!